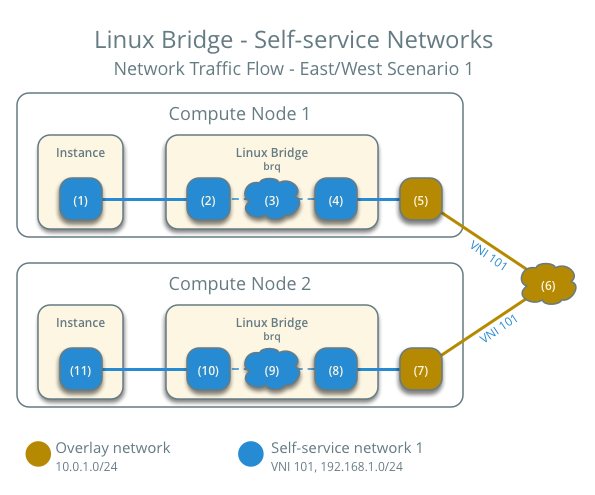 This architecture example augments Linux bridge: Provider networks to support a nearly limitless quantity of entirely virtual networks. Although the Networking service supports VLAN self-service networks, this example focuses on VXLAN self-service networks. For more information on self-service networks, see Self-service networks. 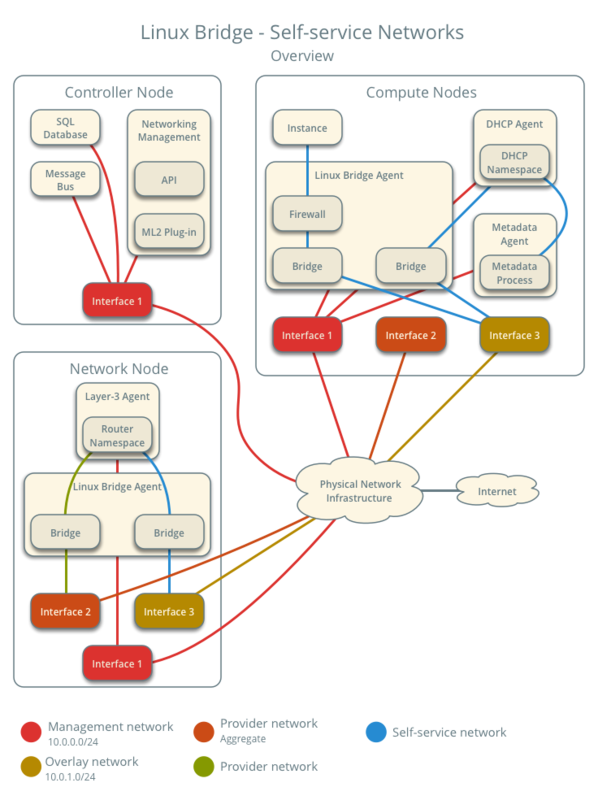 The Linux bridge agent lacks support for other overlay protocols such as GRE and Geneve. Three network interfaces: management, provider, and overlay. Add one network interface: overlay. You can keep the DHCP and metadata agents on each compute node or move them to the network node. The following figure shows components and connectivity for one self-service network and one untagged (flat) provider network. In this particular case, the instance resides on the same compute node as the DHCP agent for the network. 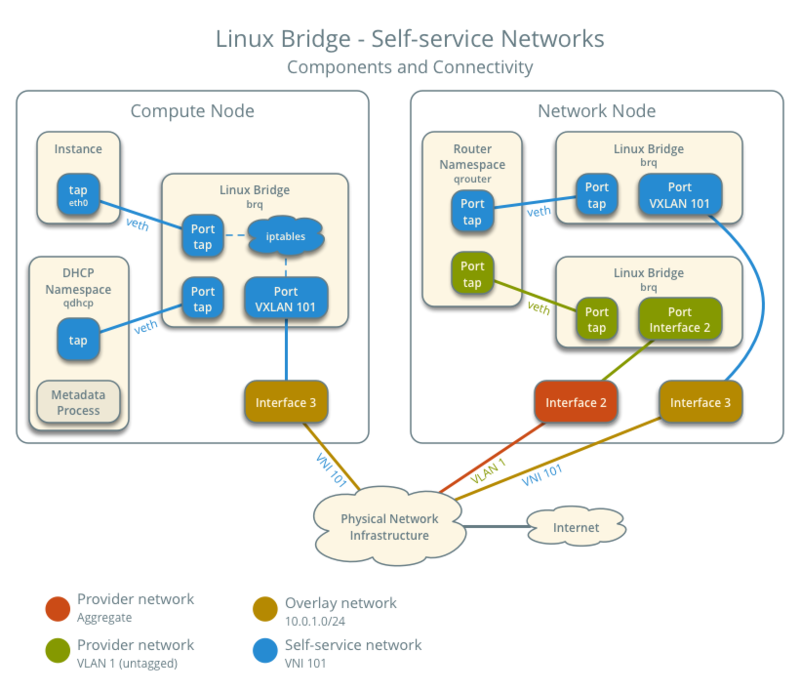 If the DHCP agent resides on another compute node, the latter only contains a DHCP namespace and Linux bridge with a port on the overlay physical network interface. Use the following example configuration as a template to add support for self-service networks to an existing operational environment that supports provider networks. Enable routing and allow overlapping IP address ranges. Add vxlan to type drivers and project network types. Enable the layer-2 population mechanism driver. Configure the VXLAN network ID (VNI) range. Replace VNI_START and VNI_END with appropriate numerical values. Install the Networking service layer-3 agent. See the Installation Tutorials and Guides and Configuration Reference for your OpenStack release to obtain the appropriate additional configuration for the [DEFAULT], [database], [keystone_authtoken], [nova], and [agent] sections. In the linuxbridge_agent.ini file, configure the layer-2 agent. By default, Linux uses UDP port 8472 for VXLAN tunnel traffic. This default value doesn’t follow the IANA standard, which assigned UDP port 4789 for VXLAN communication. 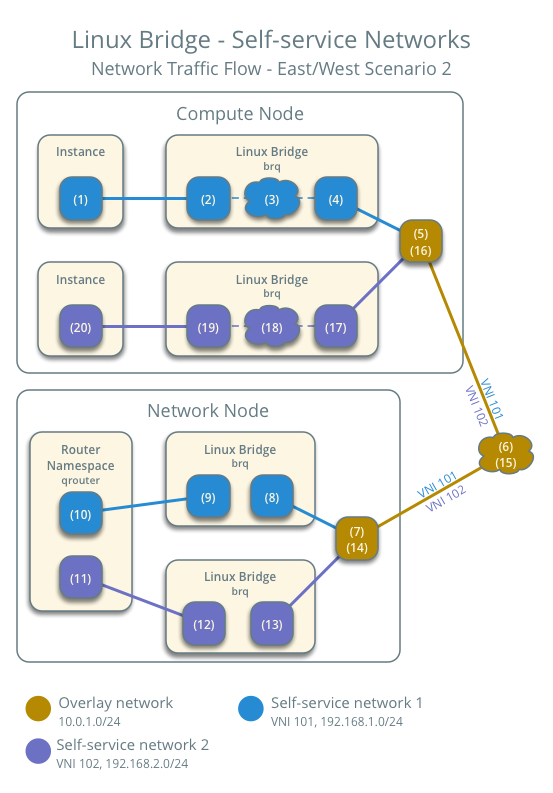 As a consequence, if this node is part of a mixed deployment, where nodes with both OVS and Linux bridge must communicate over VXLAN tunnels, it is recommended that a line containing udp_dstport = 4789 be added to the [vxlan] section of all the Linux bridge agents. OVS follows the IANA standard. Replace PROVIDER_INTERFACE with the name of the underlying interface that handles provider networks. For example, eth1. Replace OVERLAY_INTERFACE_IP_ADDRESS with the IP address of the interface that handles VXLAN overlays for self-service networks. In the l3_agent.ini file, configure the layer-3 agent. In the linuxbridge_agent.ini file, enable VXLAN support including layer-2 population. Verify presence and operation of the agents. The configuration supports multiple VXLAN self-service networks. For simplicity, the following procedure creates one self-service network and a router with a gateway on the flat provider network. The router uses NAT for IPv4 network traffic and directly routes IPv6 network traffic. IPv6 connectivity with self-service networks often requires addition of static routes to nodes and physical network infrastructure. Update the provider network to support external connectivity for self-service networks. Source a regular (non-administrative) project credentials. Create a IPv4 subnet on the self-service network. Create a IPv6 subnet on the self-service network. Add the IPv4 and IPv6 subnets as interfaces on the router. These commands provide no output. Add the provider network as the gateway on the router. On each compute node, verify creation of a second qdhcp namespace. On the network node, verify creation of the qrouter namespace. Create the appropriate security group rules to allow ping and SSH access instances using the network. Launch an instance with an interface on the self-service network. For example, a CirrOS image using flavor ID 1. Replace NETWORK_ID with the ID of the self-service network. Determine the IPv4 and IPv6 addresses of the instance. The IPv4 address resides in a private IP address range (RFC1918). Thus, the Networking service performs source network address translation (SNAT) for the instance to access external networks such as the Internet. Access from external networks such as the Internet to the instance requires a floating IPv4 address. The Networking service performs destination network address translation (DNAT) from the floating IPv4 address to the instance IPv4 address on the self-service network. On the other hand, the Networking service architecture for IPv6 lacks support for NAT due to the significantly larger address space and complexity of NAT. Thus, floating IP addresses do not exist for IPv6 and the Networking service only performs routing for IPv6 subnets on self-service networks. In other words, you cannot rely on NAT to “hide” instances with IPv4 and IPv6 addresses or only IPv6 addresses and must properly implement security groups to restrict access. On the controller node or any host with access to the provider network, ping the IPv6 address of the instance. Optionally, enable IPv4 access from external networks such as the Internet to the instance. Create a floating IPv4 address on the provider network. Associate the floating IPv4 address with the instance. On the controller node or any host with access to the provider network, ping the floating IPv4 address of the instance. PING 203.0.113.16 (203.0.113.16) 56(84) bytes of data. Obtain access to the instance. Test IPv4 and IPv6 connectivity to the Internet or other external network. For instances with a fixed IPv4 address, the network node performs SNAT on north-south traffic passing from self-service to external networks such as the Internet. For instances with a fixed IPv6 address, the network node performs conventional routing of traffic between self-service and external networks. The instance resides on compute node 1 and uses self-service network 1. The instance sends a packet to a host on the Internet. The instance interface (1) forwards the packet to the self-service bridge instance port (2) via veth pair. Security group rules (3) on the self-service bridge handle firewalling and connection tracking for the packet. The self-service bridge forwards the packet to the VXLAN interface (4) which wraps the packet using VNI 101. The underlying physical interface (5) for the VXLAN interface forwards the packet to the network node via the overlay network (6). The underlying physical interface (7) for the VXLAN interface forwards the packet to the VXLAN interface (8) which unwraps the packet. The self-service bridge router port (9) forwards the packet to the self-service network interface (10) in the router namespace. For IPv4, the router performs SNAT on the packet which changes the source IP address to the router IP address on the provider network and sends it to the gateway IP address on the provider network via the gateway interface on the provider network (11). For IPv6, the router sends the packet to the next-hop IP address, typically the gateway IP address on the provider network, via the provider gateway interface (11). The router forwards the packet to the provider bridge router port (12). The VLAN sub-interface port (13) on the provider bridge forwards the packet to the provider physical network interface (14). The provider physical network interface (14) adds VLAN tag 101 to the packet and forwards it to the Internet via physical network infrastructure (15). Return traffic follows similar steps in reverse. However, without a floating IPv4 address, hosts on the provider or external networks cannot originate connections to instances on the self-service network. For instances with a floating IPv4 address, the network node performs SNAT on north-south traffic passing from the instance to external networks such as the Internet and DNAT on north-south traffic passing from external networks to the instance. Floating IP addresses and NAT do not apply to IPv6. Thus, the network node routes IPv6 traffic in this scenario. A host on the Internet sends a packet to the instance. The physical network infrastructure (1) forwards the packet to the provider physical network interface (2). The provider physical network interface removes VLAN tag 101 and forwards the packet to the VLAN sub-interface on the provider bridge. The provider bridge forwards the packet to the self-service router gateway port on the provider network (5). For IPv4, the router performs DNAT on the packet which changes the destination IP address to the instance IP address on the self-service network and sends it to the gateway IP address on the self-service network via the self-service interface (6). For IPv6, the router sends the packet to the next-hop IP address, typically the gateway IP address on the self-service network, via the self-service interface (6). The router forwards the packet to the self-service bridge router port (7). The self-service bridge forwards the packet to the VXLAN interface (8) which wraps the packet using VNI 101. The underlying physical interface (9) for the VXLAN interface forwards the packet to the network node via the overlay network (10). The underlying physical interface (11) for the VXLAN interface forwards the packet to the VXLAN interface (12) which unwraps the packet. Security group rules (13) on the self-service bridge handle firewalling and connection tracking for the packet. The self-service bridge instance port (14) forwards the packet to the instance interface (15) via veth pair. 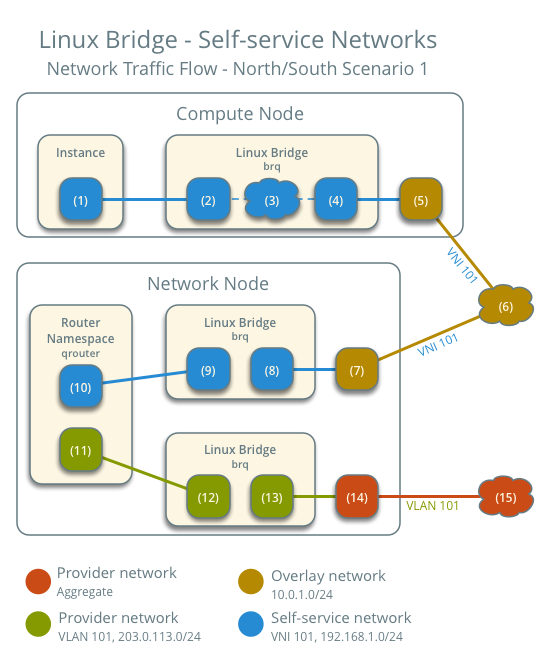 Egress instance traffic flows similar to north-south scenario 1, except SNAT changes the source IP address of the packet to the floating IPv4 address rather than the router IP address on the provider network. Instances with a fixed IPv4/IPv6 or floating IPv4 address on the same network communicate directly between compute nodes containing those instances. By default, the VXLAN protocol lacks knowledge of target location and uses multicast to discover it. After discovery, it stores the location in the local forwarding database. In large deployments, the discovery process can generate a significant amount of network that all nodes must process. To eliminate the latter and generally increase efficiency, the Networking service includes the layer-2 population mechanism driver that automatically populates the forwarding database for VXLAN interfaces. The example configuration enables this driver. For more information, see ML2 plug-in. Instance 1 resides on compute node 1 and uses self-service network 1. Instance 2 resides on compute node 2 and uses self-service network 1. Instance 1 sends a packet to instance 2. The instance 1 interface (1) forwards the packet to the self-service bridge instance port (2) via veth pair. The underlying physical interface (5) for the VXLAN interface forwards the packet to compute node 2 via the overlay network (6). Security group rules (9) on the self-service bridge handle firewalling and connection tracking for the packet. The self-service bridge instance port (10) forwards the packet to the instance 1 interface (11) via veth pair. Return traffic follows similar steps in reverse. Instances using a fixed IPv4/IPv6 address or floating IPv4 address communicate via router on the network node. The self-service networks must reside on the same router. Instance 2 resides on compute node 1 and uses self-service network 2. Both instances reside on the same compute node to illustrate how VXLAN enables multiple overlays to use the same layer-3 network. The self-service bridge router port (9) forwards the packet to the self-service network 1 interface (10) in the router namespace. The router sends the packet to the next-hop IP address, typically the gateway IP address on self-service network 2, via the self-service network 2 interface (11). The router forwards the packet to the self-service network 2 bridge router port (12). The self-service network 2 bridge forwards the packet to the VXLAN interface (13) which wraps the packet using VNI 102. The physical network interface (14) for the VXLAN interface sends the packet to the compute node via the overlay network (15). The underlying physical interface (16) for the VXLAN interface sends the packet to the VXLAN interface (17) which unwraps the packet. Security group rules (18) on the self-service bridge handle firewalling and connection tracking for the packet. The self-service bridge instance port (19) forwards the packet to the instance 2 interface (20) via veth pair.